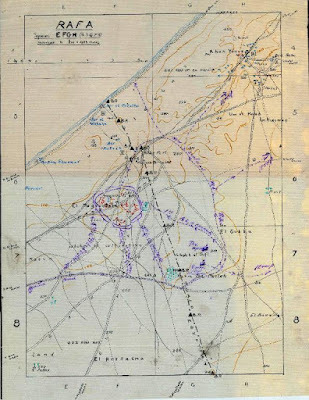 In Part I of this post last week, we discussed the lead-in to the final move in the Sinai Campaign, through the Battle of Magdhaba in late December 1916. 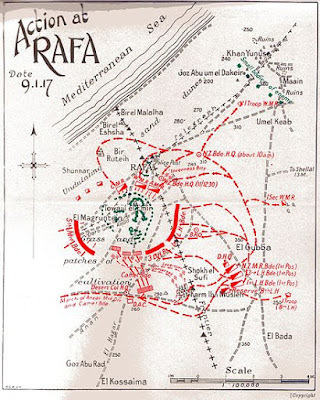 After the surrender of the Ottoman position at Magdhaba, the main remaining Ottoman position inside Egyptian Sinai was at Rafah, then as now right on the border with what was then Ottoman Palestine. 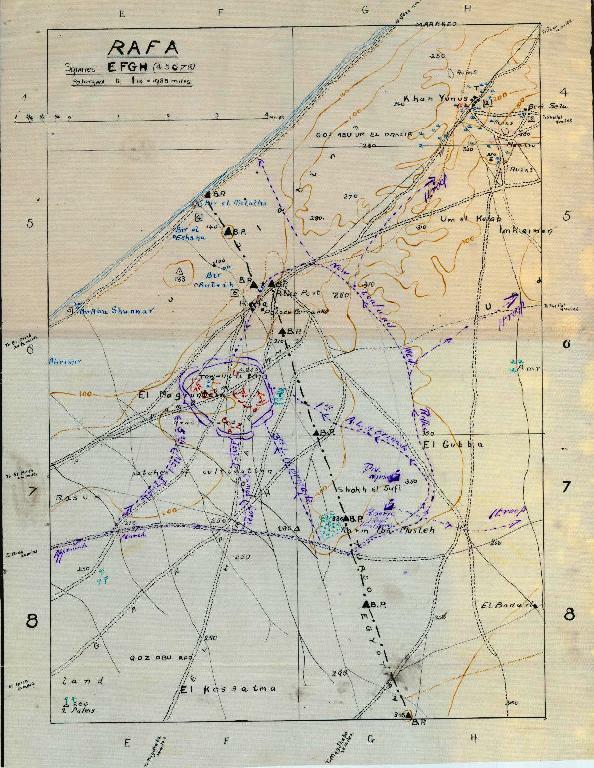 As January 1917The British knew from aerial reconnaissance that 2000 to 3,000 Ottoman and German troops were entrenched at Magruntein southeast of Rafah and others massing around the border. Meanwhile German aircraft bombed British troops at El ‘Arish. 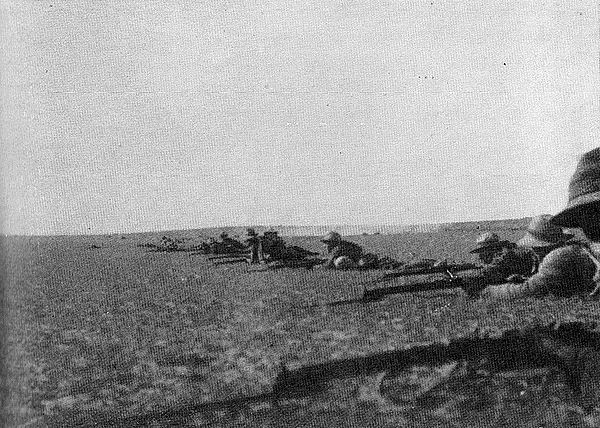 The Allied Forces in Sinai constituted the Desert Column, under the command of Gen. Philip Chetwode, based at El ‘Arish. 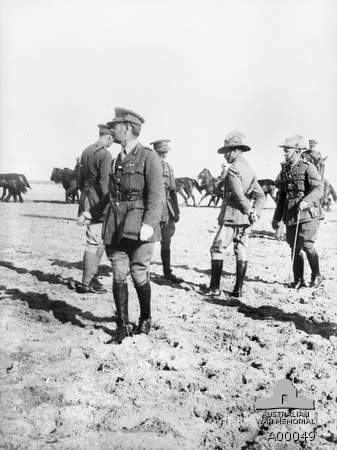 The main operational force, as at Magdhaba, would be the ANZAC Mounted Corps, consisting of three brigades of Australian Light Horse and a New Zealand Mounted Rifle Division, all under the command of Harry Chauvel, a Queensland soldier who would prove to be the first Australian full general and probably the most famous cavalryman of World War I. The ANZACs advanced overnight and discovered the enemy strongly entrenched in country that was generally open and without cover. Using similar tactics to Magdhabs, relying on the mobility of the Light Horsemen, tje ANZACs sought to surround the Turkish fortifications and then, fighting dismounted, to attack their positions. But dismounted cavalry may have great mobility but provide a weak line fighting dismounted, and throughout much of the day, Chauvel's men were repeatedly driven back by the Turkish redoubts. 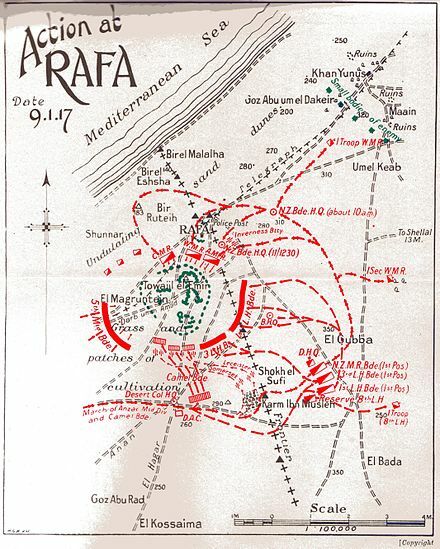 As the battle continued, Chetwode became aware that significant Turkish reinforcements numbering 2500 or more were advancing from Gaza. Without going into extreme tactical detail, the British Empire forces had a hard slog. German aircraft were bombing them, while Australian aircraft provided recon and target spotting. In this open desert country, air power really showed its usefulness. By afternoon, reports of the approach of Ottoman reinforcements and stubborn resistance led Chetwode, who was not on the battlefield, telephoned an authorization for retreat and withdrawal. The decision to withdraw, however, came while the 1st New Zealand Mounted Rifles and the Imperial Camel Corps were on the offensive. 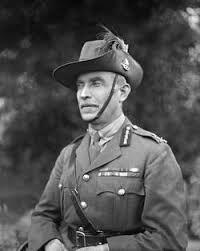 The New Zealanders, under the command of Gen. Edward Chaytor, decided to delay withdrawal until the current offensive played out. Attacking from the north in a bayonet charge as the Camel Corps attacked elsewhere, the New Zealanders managed to seize the Central Redoubt of the Ottoman position, and the resistance began to collapse. 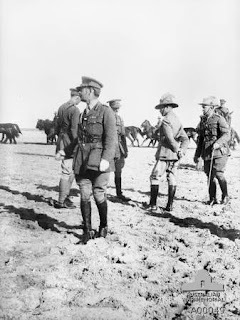 In the process, the Kiwis achieved another distinction: by swinging northeast beyond the Ottoman border, they could claim to have initiated the Palestine Campaign at the moment they were ending the Sinai Campaign. 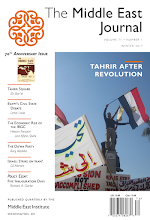 Rafah was a small action, but it came to conventionally maek the end of the Sinai Campaign and the overture to the Palestine Campaign. Below, a hand-drawn map from 1917.